View of the Grand Salon gallery space inside the Renwick Gallery, home of the Smithsonian American Art Museums craft and decorative art program, in Washington, D.C. Photo: Ron Blunt. 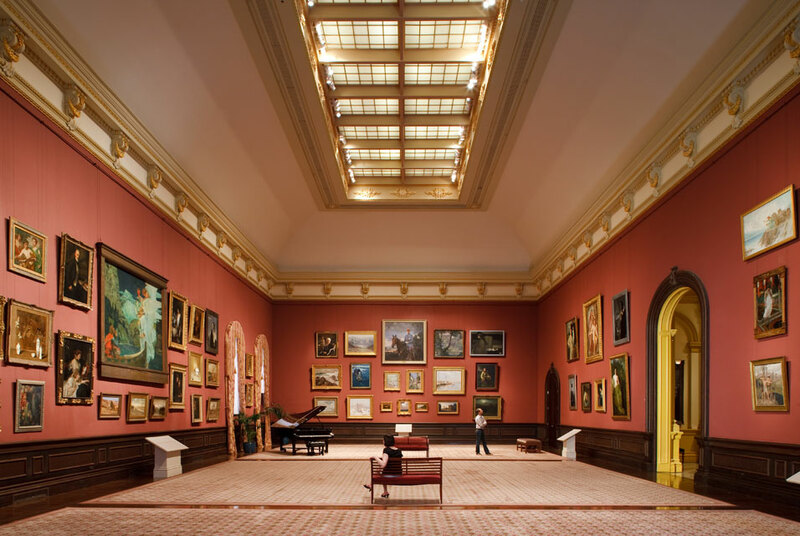 WASHINGTON, DC.- The Smithsonian American Art Museum has selected five finalists for the Grand Salon design competition that is part of a forthcoming major renovation of the Renwick Gallery, home of the museums craft and decorative art program since 1972. The five firms are Applied Minds, Marlon Blackwell Architect, Studio Odile Decq, Vinci Hamp Architects and Westlake Reed Leskosky. The international design competition invited selected interior designers, artists and architects to envision the 4,300-square-foot Grand Salon anew as a must-see destination for contemporary audiences. Each was asked to consider the relationship of a contemporary-designed interior within an historic one and create a spectacular destination space suitable for public programs, civic occasions and special events. Applied Minds is an interdisciplinary company based in Glendale, Calif., that works at the crossroads of art, information, science, technology, design and society. Marlon Blackwell Architect is an architecture practice based in Fayetteville, Ark., that is internationally recognized for bold designs that draw upon vernaculars and the contradictions of place. Studio Odile Decq, a design firm based in Paris, is known for spatial and interactive experimentation in urban planning, architecture, design products and art. Vinci Hamp Architects, a Chicago-based design firm, is noted for its arts installations and historic preservation projects. Westlake Reed Leskosky, architects, engineers and technology designers based in Cleveland, is nationally recognized for thoughtful, innovative solutions and integrated design for cultural arts facilities, museums and historic restoration. The five finalists will present refined concepts and cost estimates for the design concept build-out in June. Private funds will be raised to implement the proposed design once a final concept has been selected. The selected final design will be announced in summer. No structural alterations will be allowed to the Grand Salon. If accepted, the new Grand Salon design will remain in place for a minimum period of five years. A major renovation of the Renwick Gallery is in the design phase. The renovation, which will begin in 2014, will include a completely renewed infrastructure, enhanced historic features and other upgrades to the National Historic Landmark building. Additional information is available in an online press kit, americanart.si.edu/pr/renwick. The Renwick Gallery is one of the most elegant examples of Second Empire architecture in the United States. The building was designed in 1859 by the distinguished architect James Renwick Jr., who also designed the Smithsonians Castle and St. Patricks Cathedral in New York City. Renwick was inspired by the Louvres Tuileries addition in Paris and modeled the gallery in the French Second Empire style that was popular at the time. The words Dedicated to Art are inscribed above the Renwick Gallerys front entry. The collection, exhibition program and publications presented by the Renwick Gallery highlight the best craft objects and decorative arts from the 19th century to the present and honor the buildings original purpose. The Renwick was added to the National Register of Historic Places in 1969, and in 1971 it was designated a National Historic Landmark building in the Lafayette Square Historic District. The Renwick Gallery is located steps from the White House in the heart of historic federal Washington. A more detailed history of the building is available in a separate document or on the museums website.